Borax crystal crafts are so much fun to make and these crystal hearts make the perfect Valentine’s Day craft for kids! 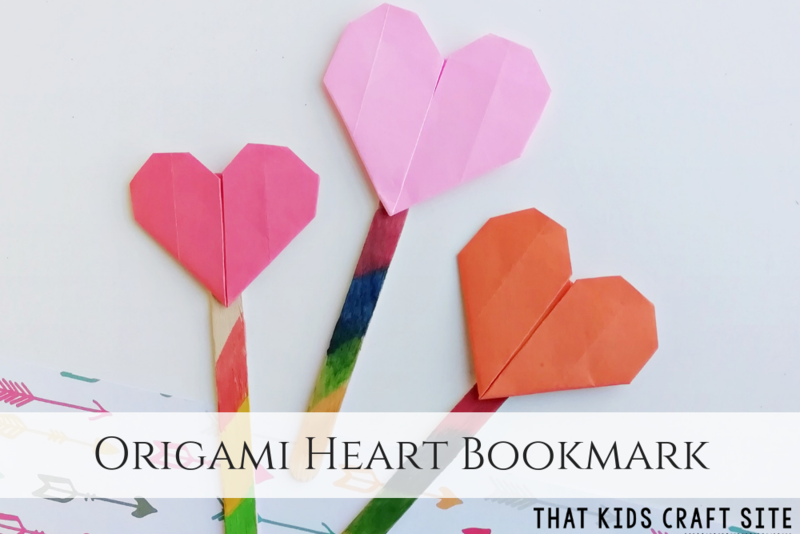 Part Valentine’s science experiment and part Valentines craft, these Borax crystal hearts are the perfect combination of learning and creativity. Making a crystal heart sun catcher shows children how mixing a couple of everyday ingredients can turn anything into a shimmering work of art. This project will get their little hands working as they shape, twist and bend pipe cleaners into hearts. 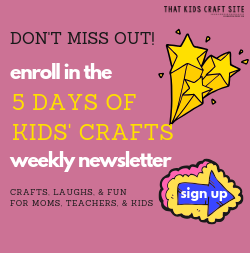 Not only will they be strengthening their fine motor skills while designing these heart sun catchers, but they’ll also get to explore and experience a little a bit of science at the same time. Watching the Borax crystals grow is so much fun! There are a number of options for this chemistry experiment / Valentine’s craft. If you’re feeling adventurous, get creative! Mix up the materials or add some color to your crystal heart. Food coloring works great to tint the crystals and give them a pretty pastel color. 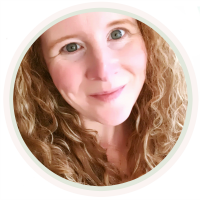 While we chose to use pipe cleaners (also known as chenille stems in the crafting world) to grow our crystals on, there are actually a number of different things that can be used. Borax crystal crafts can be made with items such as seashells, coffee filters, and even cotton balls! The sky is the limit! 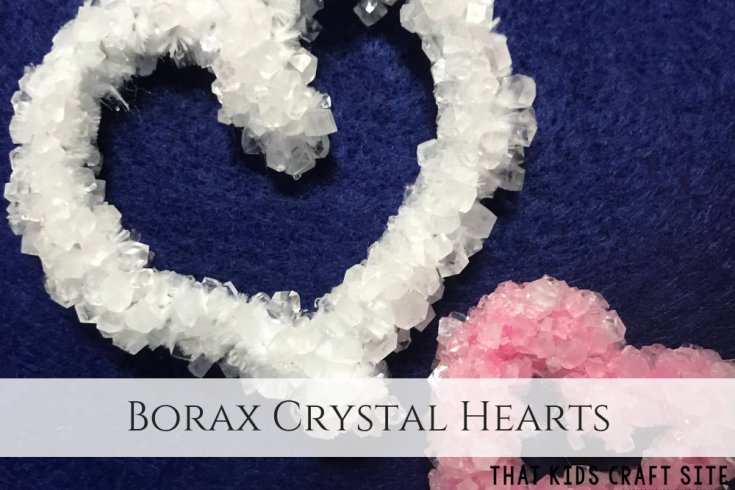 How will you and the kids make your Borax crystal heart sun catcher? Take the pipe cleaners and form hearts of all sizes. If you need some help, try using a heart-shaped cookie cutter as a guide. Adults: Boil water and pour into glass jar. Add 3 tablespoons of Borax for every 1 cup of water and stir. This is a job best for adults or older kids as the water is very hot. Suspend a heart-shaped pipe cleaner into the jar (1 per jar) making sure it’s completely covered with the solution and not touching the bottom or sides of the jar. We used an extra pipe cleaner shaped into an “S” to hook the heart and suspend it from a pencil layed across the mouth of the jar. You could also use a string looped through the heart, tied around a spoon, and laid across the top of the jar as another way to suspend the heart. Let sit while solution cools for about 3 hours or so. Crystals resembling tiny little ice cubes will form all over the pipe cleaner. You could pull your heart out now or leave it overnight for maximum crystallization. Remove the heart from what is left of the solution and let it dry on a paper towel. Gently tug off the “S” shaped pipe cleaner that was used as a hook. 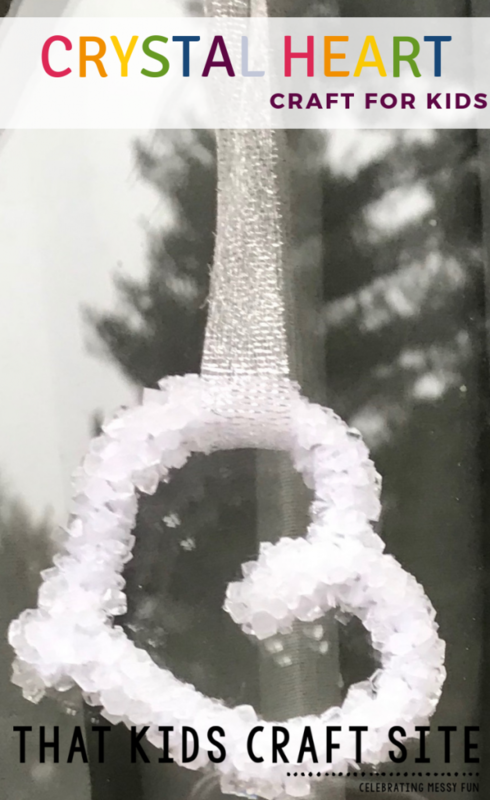 Loop a string around the crystallized heart and hang in the window to admire! Wow! The crystals are so beautiful on your new Borax crystal hearts. Keep them for yourself or give them to your special valentine! What Will Borax Crystals Stick To? Borax crystals will stick to just about any material that has a rough edge where they can adhere. Something smooth like glass isn’t such a good idea, but seashells, chenille sticks (aka pipe cleaners), yarn, and cotton balls are all fair game. How Can I Make Borax Crystals Without String? You don’t need string or yarn to make the crystals, but it is useful for keeping the piece suspended in the solution. If you don’t have a piece of string to hang your Borax crystal ornament or craft from, simply twist a chenille stick into the shape of a hook. We used chenille stems for our Borax crystal hearts, because they were a bit too heavy for the string we had. Why Didn’t My Borax Crystals Work? Sometimes Borax crystals just don’t form and in those cases we’ve found that the water we’ve used isn’t hot enough. The ratio of Borax to water might also be off. We recommend using boiling water (always have an adult do that part!). Lukewarm water isn’t hot enough to dissolve the Borax. Where Can I Get Borax? Borax can be purchased at just about any store that sells laundry washing supplies. It’s typically in a white box that’s on the top shelf. Now that slime has grown in popularity, Borax can be found almost everywhere! You can also order it online. What’s the Recipe for Making Borax Crystals? It’s quite simple to learn how to make Borax crystals. You just use 3 tablespoons of Borax to every 1 cup of boiling water. Make sure you mix well! Want to Print This Borax Crystal Hearts Valentine’s Craft? 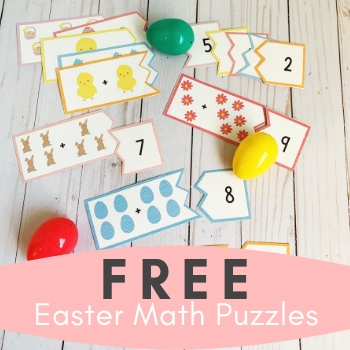 Printing this craft is easy! Simply click on the Print button in the card below and it will print out your craft instructions, as well as the Borax crystals recipe. Happy crafting! Get ready for science experiment fun with this easy Borax crystal heart craft for kids! It's a great Valentine's science experiment for kids of any age! 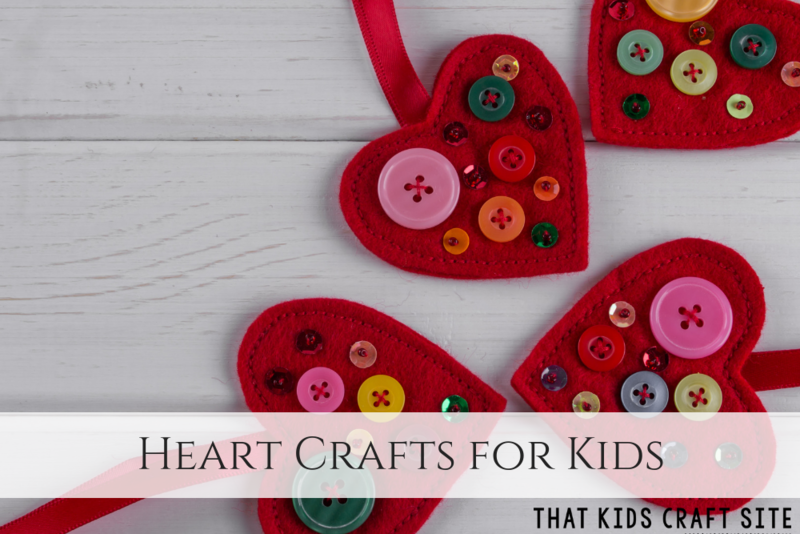 Take the pipe cleaners and form hearts of all sizes. If you need some help, try using a heart shaped cookie cutter as a guide. Suspend a heart shaped pipe cleaner into the jar (1 per jar) making sure its completely covered with solution and not touching the bottom or sides of the jar. We used an extra pipe cleaner shaped into an “S” to hook the heart and hang over the side of the jar. You could also use a string looped through the heart, tied around a spoon and laid across the top of jar as another way to suspend the heart. Let sit while solution cools for about 3 hours or so. Crystals will form resembling tiny little ice cubes all over the pipe cleaner. You could pull your heart out now or leave over night for maximum crystallization. Remove the heart from what is left of the solution and let dry on a paper towel. Gently tug off the “S” shaped pipe cleaner that was used as a hook. 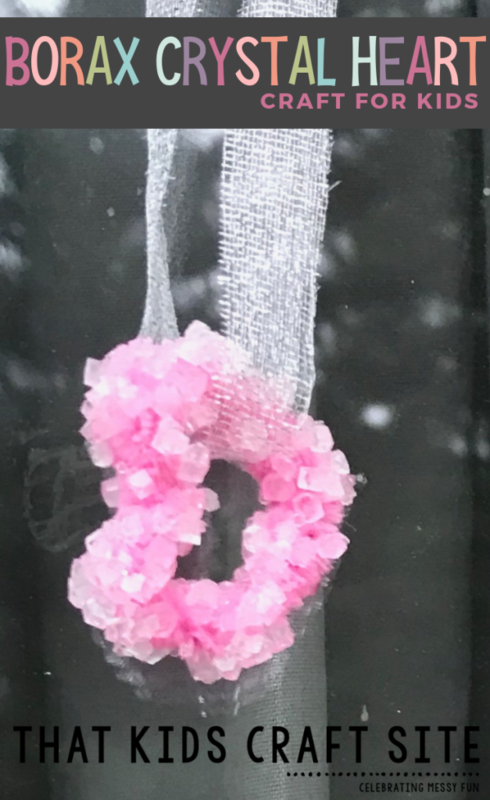 Loop a string around the crystallized heart and hang in the window to admire! THIS EXPERIMENT/CRAFT MUST BE DONE WITH ADULT ASSISTANCE! DO NOT ALLOW CHILDREN TO HANDLE THE BOILING WATER OR TOUCH THE BORAX.